Growing up I always thought it would be fun to have a giant dollhouse for all my Barbie’s to live in but alas it never came despite the multiple talks I had with Santa about it. Since this was something I wanted growing up I assumed that once my daughter was old enough she would love to have her own dollhouse as well so I went searching online for original, cute and inexpensive dollhouses. The dollhouse that I found was two of the three criteria above, original and cute, but you will see why it is not cheapest dollhouse out there. I personally think that this dollhouse is worth the money. 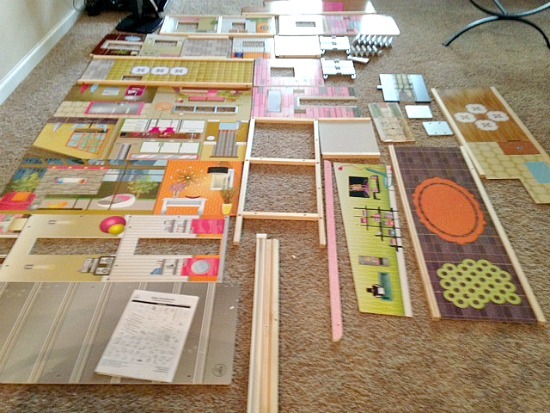 The dollhouse I found and fell in love with was the Soho Townhouse Dollhouse from KidKraft. -It includes 25 pieces of furniture. -It has 4 floors and 7 rooms. – It accommodates dolls up to 12 inches. 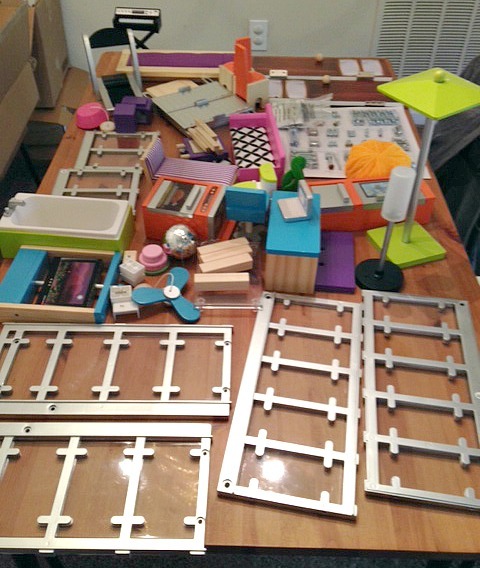 When I got the dollhouse in the mail I was very excited but assumed that I would have to put it together and I was right but I was not right about the time and number of pieces that would be involved in putting it together. The first picture is of all the walls and floors and railings. The second picture is mostly of all the furniture pieces but there are some windows and railings in that picture as well. The same day I got the package I decided to put it together since I was so excited to see the finished product, but since my husband had just gotten home from a long day at work I decided to put it together by myself and not bother him, I did end up asking him for help once or twice but the majority of it was put together by myself. I started putting it together around 8 pm, right after I put my daughter to bed, and I finished around 11 pm so it took me about 3 hours to build the whole dollhouse by myself. It was a lot of work. I set up all the furniture all nice and ready for my daughter to explore the next day. In the morning after my husband got my daughter up we took her into the living room to see the dollhouse and right away I could tell that she was happy and excited because of all the “wow”s and “oh whats that”s that she was saying! She could not wait to start playing with her new GIANT toy. She is only 16 months so she doesn’t quite understand what it is for but she loves to take the furniture out of the house as soon as I put it in and one of her favorite things about the house are the three pieces of furniture that has buttons, the toilet, piano and the outside light. She loves buttons so once she finds one of those pieces she will press the button over and over and over again. One of the things I like about this dollhouse is how tall it is. It is a little over 45 inches tall so my daughter will love it more the taller she grows because she will be able to see new floors and furniture. 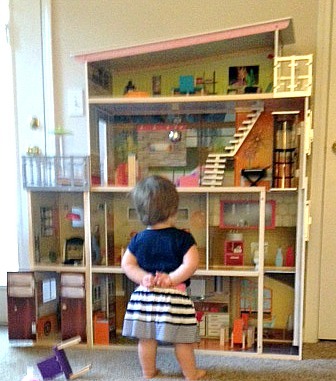 Below is a picture of my 16 month old daughter, who is about 30-35 inches tall, in front of the dollhouse so you can get a better idea of how big the dollhouse is. Since it is so tall and wide it does come with pieces to screw it into the wall to decrease the chances of it falling over on your child while they are playing. To give you a better idea of what this dollhouse is all about I made a video showing a little “tour” of the dollhouse and it’s furniture. 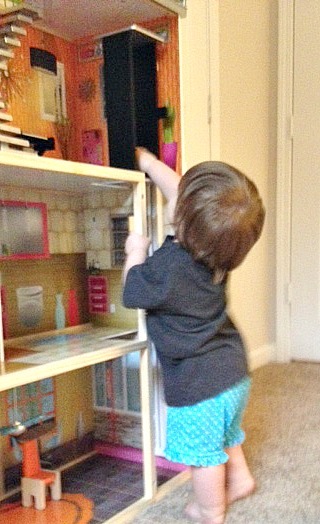 Here are a couple more pictures of my daughter playing with her new dollhouse. Check out the KidKraft website and Facebook for more dollhouses (you can buy your own KidKraft dollhouse on Amazon from prices ranging $100 to around $200) and other kid fun! Let us know in the comments which dollhouse is your favorite? That is such a nice doll house. I like the prices , too. My best friend had one similar to that when we were growing up and I was always so jealous of hers. Wow this is amazing. 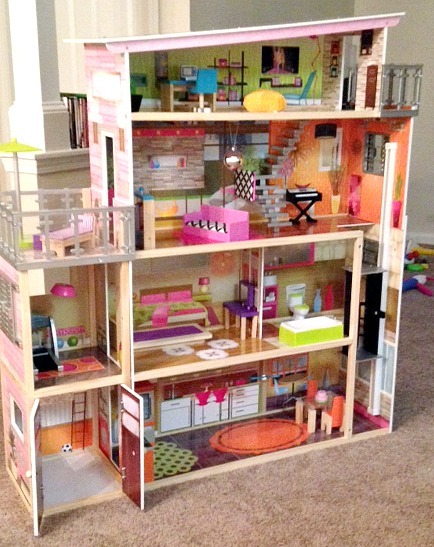 I can’t wait until my toddler is old enough to have a dollhouse as nice as this one. I will be reliving my childhood dollhouse fantasies through her, lol. It looks a little complicated to put together with all of those small pieces but would be a great mother/daughter weekend project. That’s for sharing, it really is beautiful! Thank you for the info on the SOHO dollhouse. Santa is wondering if you think that the dollhouse can be assembled at one home, loaded into a SUV styled sleigh, and placed into its permanent home without being completely damaged? 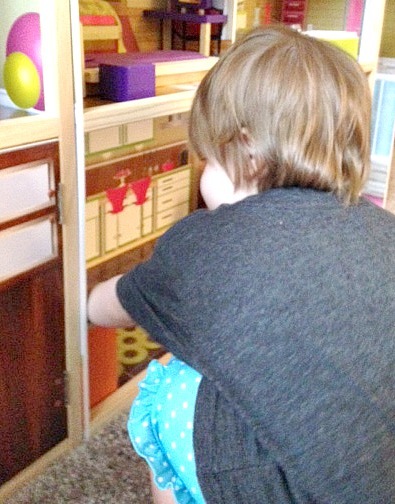 My daughter loves her dollhouse, all her friends love to play on it when they stay over. I found a pretty good deal at buykidkraft and they shipped it over really fast, highly reccomend it.